Author bio at the end of the post. Creating a website with a responsive design becomes essential these days. A mobile-optimized web design will always help you increase the flow of web traffic on your business website. You can opt for a responsive design that can run smoothly on different mobile platforms and screen sizes – as this gives a tremendous accessibility to both mobile and desktop visitors. According to a survey, around 38% of the total share of web traffic comes from mobile devices. And we can expect that 2016 will be the mobile first world. That is the main reason why website owners are creating mobile-optimized websites. If your website doesn’t support mobile phones and tablets, then immediately switch over to a mobile-friendly website. WordPress offers a ton of overwhelming plugins that will help you create mobile responsive sites, without any heavy lifting. In this blog post, I will shed some light on the top WordPress plugins that will help you make a mobile-friendly website in a matter of minutes. The Any Mobile Theme Switcher is a perfect WordPress plugin for creating mobile-friendly websites. It is easy to install and it works by detecting the mobile browser of the mobile device that is trying to access your site. It displays a most relevant theme based on the pre-set options – thus it works smoothly on different devices, mobile platforms, and screen sizes. It is an ideal plugin for those who want to run a mobile-optimized website. The plugin automatically detects Android, iPhones, iPods, Windows Mobile, Opera Mini, Blackberry, etc and lets you set a theme accordingly. The Any Mobile Theme Switcher plugin is also available in pro version that comes with a ton of advanced functions. The pro version of this plugin works well with the W3 Total Cache plugin and also offers multiple homepages to different mobile devices. Plus, it is integrated with QR code for an easy and quick mobile bookmarking. WPtouch is a simple, intuitive and flexible mobile site plugin for WordPress that automatically embeds an intriguing mobile theme into your site for your potential mobile visitors. The plugin offers a lot of customization options and settings to let you create a customized site, without ever getting your hands dirty in coding. It also offers a decent theme to help you get started. It automatically displays a mobile-friendly version of a site when a visitor opens your site from its mobile phone. This will give a better user experience to your desktop viewers as well as your mobile viewers. For more advanced functionalities, you can upgrade the plugin to the premium version, which allows users to add advertising to their mobile-friendly website and improve their revenue via clicks. It also offers different mobile-optimized themes to allow users to create a mobile website in a matter of few clicks. If you want to create a mobile-friendly website without any coding or programming knowledge, then install WP Mobile Edition plugin. It is a fantastic WordPress plugin that comes with a complete toolkit to let you switch your simple site to a mobile-optimized one, without even writing a single piece of code. It also offers a mobile switcher and multiple theme options to help you create a site the way you always wanted. The plugin works well on different mobile platforms such as Android phones, iPhones, and Windows phones. It includes an easy and intuitive user interface to allow a webmaster to customize their mobile site within a few clicks. Like other mobile site plugins, WP Mobile Edition also detects the device accessing by a visitor and quickly loads a theme on their mobile. Users can only choose a single mobile theme to be displayed to mobile users. It means that your potential visitors will see the same mobile page regardless of the mobile device they use. Obox Mobile is a premium WordPress plugin that will help you convert your site into a mobile-friendly version, without any coding. It makes your site compatible with different mobile devices and potentially improves your site’s revenue. With the Obox mobile plugin, you can improve the speed of your site, enhance readability and accessibility, and provide a better user experience to all your mobile visitors. Additionally, you can tweak the design, colors, fonts, logos and backgrounds of your mobile website without any coding skill. The NEW WordPress Mobile Pack enables site owners to package their existing content into a cross-platform mobile web application. This is an ideal plugin for content curators, writers, bloggers, and publishers who want to amplify their site’s content without creating a mobile app from the scratch. In other words, WordPress Mobile Pack plugin gives you both desktop and mobile versions with the enhanced user-experience. The plugin works seamlessly on all major browsers such as Google Chrome, Safari, Firefox, Internet Explorer 10, Android-native browsers, etc. Best of all, it makes it super easy to create a mobile-ready website as you won’t need to hire any professional developer or get your hands dirty in coding –it is as simple as clicking a button. Jetpack is one of the best plugins for WordPress. It gives you more than just a simple mobile-friendly design. 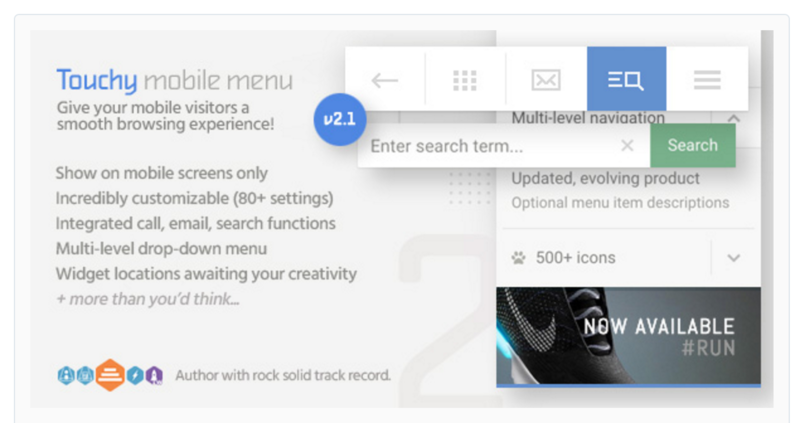 The plugin offers more than 33 specific features that enable you to craft a fully-responsive site the way you want. You can also modify your site if you are familiar with PHP, CSS, HTML or other programming languages. Plus, you can use contact forms, Custom CSS or transform your image galleries with Carousel within a few clicks. Touchy is a mobile menu plugin for WordPress that helps you design an enticing menu version for mobile devices. In fact, it can also be used on fully-fledged desktop websites – it has been tested on multiple browsers to determine whether it works the same everywhere or not. This is a modern-age plugin that makes it easy for site owners to create mobile-friendly websites in a quick time frame. Any of these plugins is suitable to create a mobile-ready website. You can choose after analyzing your business needs and specifications. So, reboot your website by making it compatible with different devices, mobile platforms, and screen sizes. Have you used any of these plugins before? What are you experiences? Share your thoughts in the comments below. Author Bio: Lucy Barret is a talented blogger and Web Developer. Currently, she is employed at HireWPGeeks Ltd. and provides WordPress Development Services along with her team of experienced developers. She is also a soccer fan and her favorite team is Manchester United F.C.